You can automate upto 80% of routine customer service tasks. Directly impacts your service levels by both time and money investments. 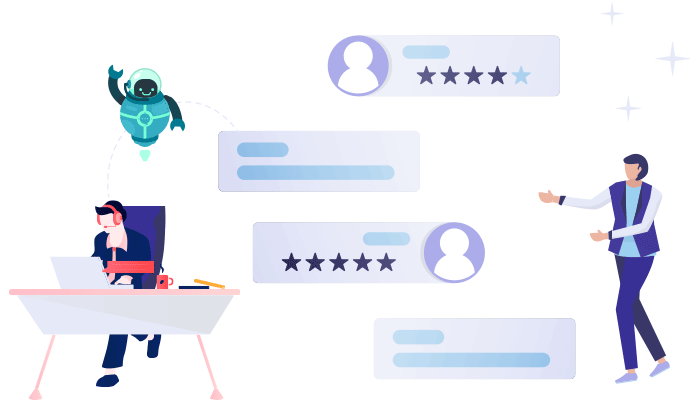 See and measure Customer Satisfaction increase daily with the help of chatbots. The speed gained via chatbot automation lets you focus more on delivering product, services and marketing. Customer Service is now more deliverable, measureable and improvable. Your customer service department most probably invests times in routine queries. Automate your customer service with Chatbots. To customers, the speed and resolution of problem is more important. Deliver by their expectations. When queries are resolved at the speed of a chat, Customer is happy with your brand. Why does your customer need to install app or wait on a phone line. They can now chat with you on a chatbot. Customer satisfaction is more important to you. And, for our chatbots too.